Unusually for Florence, you’re not allowed to take photos inside Santa Maria Novello (the huge church handily just across the road from the station. I’m not aiming to walk as far today). 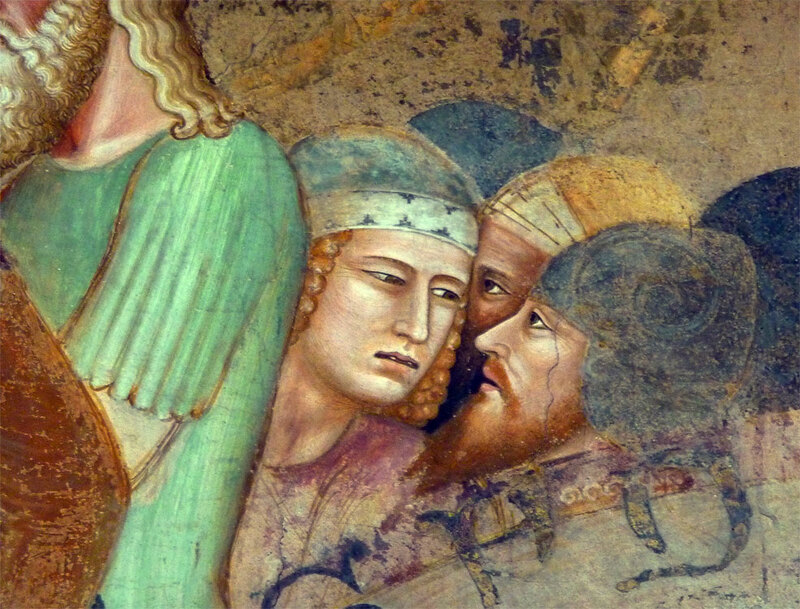 So you’ll just have to take my word for the wonderful Giotto crucifix, single Massacio and Botticello frescos, the entire sanctuary full of Ghirlandaio frescos and the Strozzi chapel, frescoed by Fillippino Lippi. Both of these latter are undeniably spectacular, floor to ceiling of vivid, intricate images, but ultimately I keep coming back to the things which seem to me full of real feeling. The crucifix, and the Massacio & Botticelli frescos – the one an almost severely formal Trinita, the other an early, charmingly informal nativity scene. The old man in charge of the gift shop, possibly mistaking my dewy eyes and purple shirt for signs of devotion, refuses to accept the 1€ I’m trying to give him for the two postcards I’ve selected. Either that, or he’s been there long enough to recognise when someone is genuinely moved by what they’ve just seen. My Italian just isn’t good enough to understand, as he tries to explain. In the end we just exchange smiles, and I keep the money. Trying to puzzle it out afterwards, I realise he’s right, in a sense. I might not be a believer in the Christian sense, but it’s becoming increasingly clear that I do believe, and that passionately, in the art. I’m deeply moved by the blazingly evident belief of the artists. There’s more to see in the museum (originally a convent) next door, if only I can find the way in. I’ve been looking forward to this ever since I read about it in the guidebook, because the cloister is decorated with a series of frescos by Paullo Uccello, one of my favourite renaissance artists. I do eventually figure it out, buying my ticket from a faintly surprised looking lady behind the desk – who breaks off her morning gossip with another lady attendant long enough to serve me. The whole place has the slightly haphazard air of a small hotel that wasn’t expecting any guests so early in the day…I’m certainly the only visitor at the moment, and it never gets what one could call busy. It’s lovely to have the place more or less to myself for most of my visit, but my gain is everyone else’s loss, this is well worth a look. 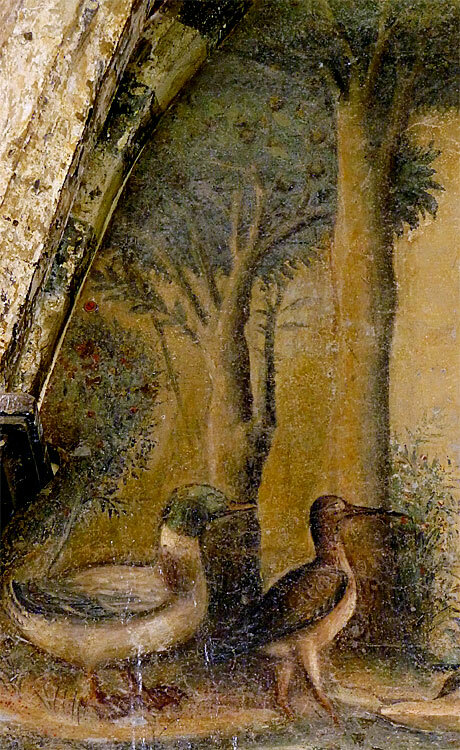 The Uccello frescos, although sadly faded, are full of interest – there’s what must have originally have been a startling panel depicting the last trump, evidence of the artist’s fascination with perspective, an expulsion of Adam and Eve from the garden of Eden where one can get some sense of what must have been a beautifully verdant garden…and I’m particularly taken with the animals and birds that crowd in everywhere, or lurk in corners watching the action in the main scene. It would be so wonderful to see these restored to their former glory, but I suspect that the current orthodoxy – which sanctions cleaning and arresting decay, but little actual re-creation – makes that a remote possibility. All the more frustrating, then, in a sense, that just off the cloister is the Spanish Chapel (so called as it was used by members of Eleonora de Toledo’s court in the 16th C, and was once the headquarters of The Inquisition) which is completely covered by extremely well preserved frescos by a relatively unknown artist called Buonaiuto. Ironies of preservation aside, though, the more I look, the more I realise that this is a magical place. A real little gem, whose relative obscurity seems to have ensured that it remains untouched, largely as the artist originally conceived it. A rarity, where every church and chapel seems compounded of the additions and alterations of passing centuries. Sitting quietly on one of the thoughtfully placed benches, enjoying the riot of colour and detail around me, it finally occurs to me why I have such a fondness for this, essentially mediaeval, style of painting. It’s not just that they tend to be strikingly narrative and full of beautiful detail. I remember that mum had a book of Uccello, and spending hours poring over it as a child; loving the details and the odd perspective effects. Fascinated by an art which is neither simple nor as naive as it can at first appear. On the contrary, the best of it is very sophisticated indeed (as I now realise) in that it strives to represent an idea of the world, a cognitive, imaginative construct; rather than simply what can be seen around us. 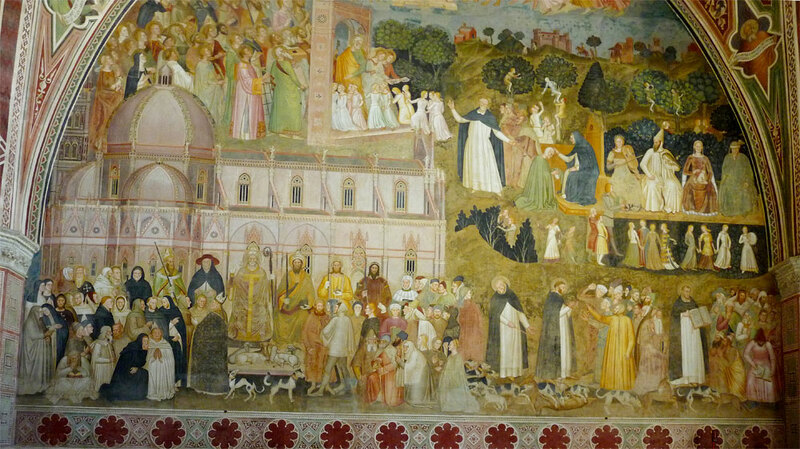 The big frescoes seem more like conversations with the viewer, sharing the story. Like all good storytellers, the painters choose – what to leave in, what to exclude – they are consciously edited abstractions that also include jokes, asides and telling details. Medieval art is often characterised as a means of conveying (largely) religious messages to a mostly illiterate populous, which is no doubt true. True, but also misleading to current sensibilities, which will almost unconsciously equate ‘illiterate’ with ‘stupid’. Hardly likely to have ever been the case. Despite our increasing saturation with images of all sorts, we are still overwhelmingly a text-based culture. So used to text customarily carrying all the inflexions and subtlety of meaning, indeed, that we tend to forget that it can also be done pictorially, with just as much complexity and depth. The cleverness of the modern graphic designer, employed in the service of our own gods of consumption seems thin and contrived, compared to the old masters of the renaissance. I am delighted to be encountering all this wonderful stuff….but a little embarrassed, also, as each new discovery reveals the depths of my ignorance. Freed of many of the workaday concerns that usually tend to fill the head with flannel, I’ve noticed a number of minor visual pre-occupations floating to the surface. 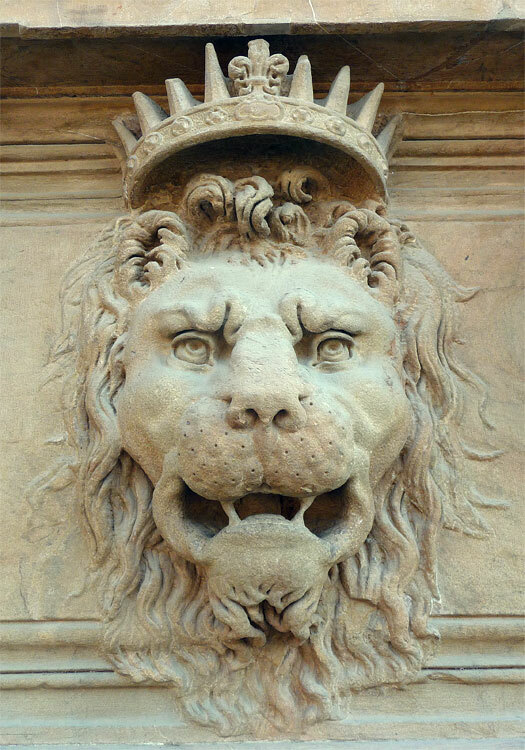 I’m becoming mildly obsessed with lions, images of which I keep seeing, and photographing, all over the place. It’s become a little game I’m playing with myself, to see how good a collection I can amass. 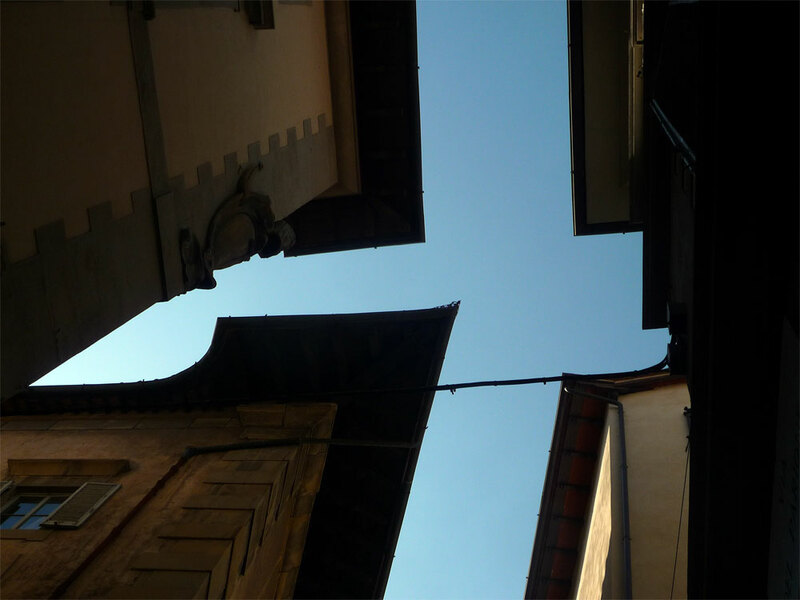 Something else, which I reckon started in Lucca, and which I caught myself indulging today, is a fascination with the shapes (often looking straight upwards, but not always) between adjacent buildings, roofs etc. There’s something deeply satisfying in the multiplicitious variety of glimpses of the sky they afford – hard to explain in words, but maybe the photos will make a bit more sense of it (I’m quite prepared to accept that it’s just me, though) It’s as if I’m collecting a series of keys with which to unlock ever more layers of the city. 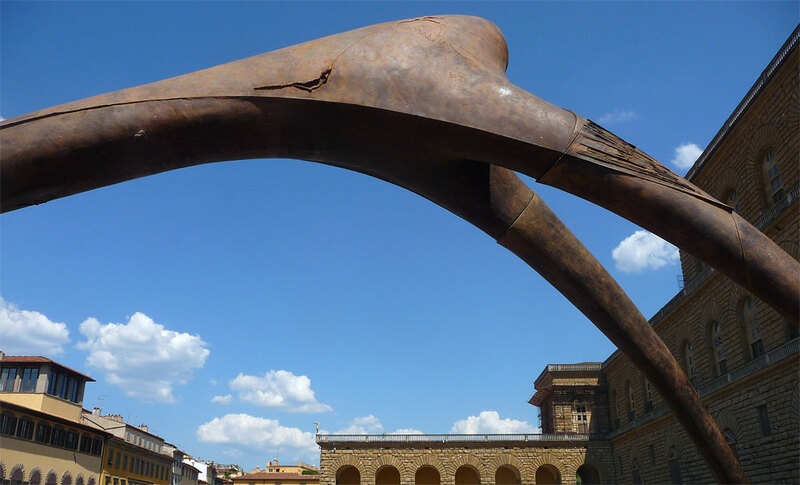 Florence, in particular, has the air of a place of multiple histories, about which one could spin endless stories. Somehow, the very fabric of the place is both intricate and elastic enough to make them all seem at least plausible, if not strictly true…like the tale about the strange race of fish-headed folk that live in the river who only emerge in the dead of night, creeping silently about the narrow streets preying on the drunks and strays. They’re tolerated due to an ancient bargain, struck with Cosimo di Medici, which grants them safety in return for their unrivalled knowledge of currents and tides (vital for trade)…a strange, slightly disturbing legend which I just invented. Maybe this richness of possibility is one of the true hallmarks of the city. 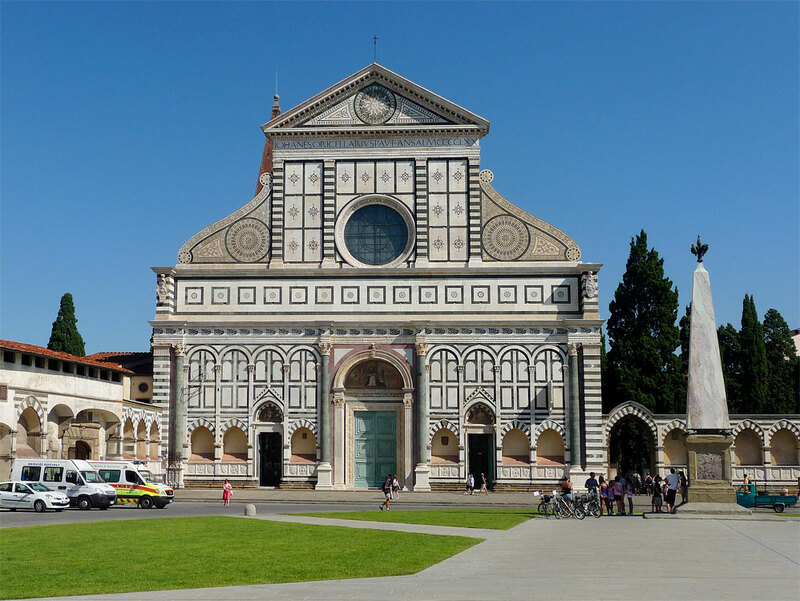 Why Lucca is definitely a city, although it’s tiny, and also why it’s perfectly possible to build new towns…but not new cities. You can plan a town, but the depth of complexity that characterises a true city can’t be designed, it has to grow, to develop slowly over many generations.